Hello friends , BSC magazine के इस Series में आज हम BSC magazine April 2018 का Hindi और English में Free PDF ले कर आये है. जो Aspirants SSC , Bank, UPSC, CDS अन्य examination की तैयारी करते है उनके लिए हर महीने Monthly magazine provide कराते है . 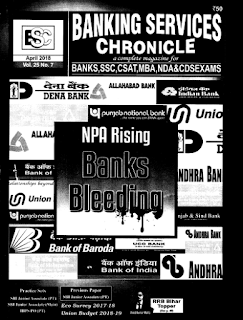 इसमें economy survey 2017-18, Latest economy issue जैसे PNB घोटाला, current affairs और SBI exam के लिए practice Paper दिया गया है. Banking services chronicle April 2018 के PDF यहाँ से आप hindi और English language में फ्री में Download कर सकते है.